I haven't posted anything here in a while but today I finally managed to upload and sort through the pictures in our camera and I have a few posts prepared for the next few days. 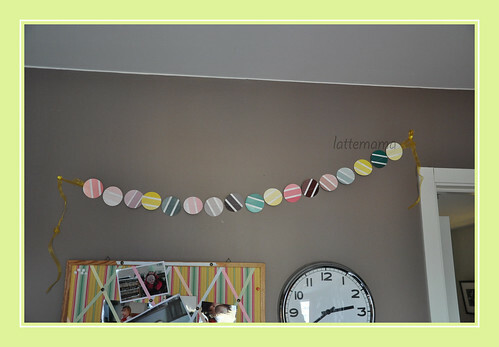 Here's a fun bunting idea I probably found via Pinterest. The wall above my computer desk was bare and boring and I had been looking for something fun to spruce it up with. I had a pile of paint chips from when we were considering painting the kitchen and I cut them up with a craft punch then ran them through the sewing machine. I sewed on a piece of ribbon at the beginning and end for easier hanging. The wall still lacks some oompf but at least it looks less bare now.